Trouwens, mijn favourite is ForceEffect. 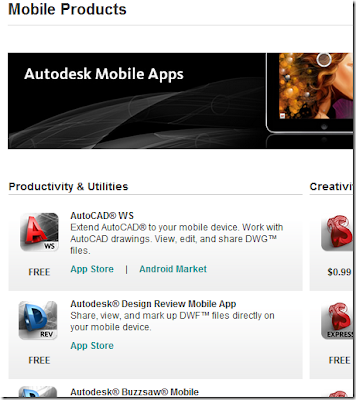 AutoCAD® WSExtend AutoCAD® to your mobile device. Work with AutoCAD drawings. View, edit, and share DWG™ files. Autodesk® Design Review Mobile AppShare, view, and mark up DWF™ files directly on your mobile device. Autodesk® Inventor® Publisher Mobile ViewerInteractively view animated 3D assembly instructions created with Autodesk® Inventor® Publisher software. Autodesk® ForceEffect™Analyze design concepts in the field or at the office with a simulation mobile engineering app. Autodesk® TinkerBox™Create 3D contraptions and solve mechanical riddles with this iPhone/iPod Touch puzzle game. SketchBook®A fun and intuitive drawing app. Use professional-grade tools and brushes to create and save flattened images. Bring a retro vibe to your photos—try different effects, overlays, and borders with this playful darkroom app. Autodesk® 123D™ SculptSculpt without getting your hands dirty with this digital sculpting and painting app.